GREENSBORO, N.C. – Junior Hunter Harrington and senior Dominique Maden have been named to the 2014 All-ACC Academic Men’s Tennis Team as announced by Commissioner John D. Swofford on Thursday morning. It is the second career all-conference academic team honor for both student-athletes. Harrington, a junior majoring in Management and Financial Management, is a two-time member of the All-ACC team in the classroom and on the court, as he was named to the all-conference first team in 2013 and 2014. He and Maden earned All-America honors in doubles this past season after reaching the semifinals of the NCAA Doubles Tournament and finishing the year ranked fifth nationally. The Spartanburg, S.C. native concluded the season in the top 50 of the ITA singles rankings after recording a 24-13 overall record and a 17-9 mark in dual matches, primarily at flight one. 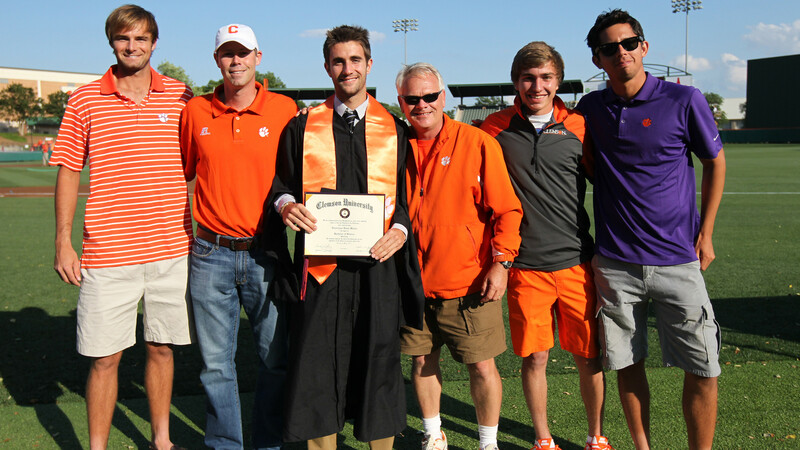 Maden graduated from Clemson in May of 2014 with a degree in Marketing. He was a member of Clemson’s Honor Roll all eight semesters of his college career, which included seven semesters on the Dean’s List. The native of Stuttgart, Germany is a two-time All-American in doubles, as he also earned the honor in 2013 playing with his brother Yannick. Maden was named to the All-ACC Second Team in 2014, and finished the season at 20-9 overall and 17-6 in dual matches, playing primarily at flight two. Click HERE to read the complete release on theACC.com.